These high velocity, lightweight .45 Auto rounds from Speer are a great choice for carry, duty, and home-defense with the properly chambered pistol or carbine! 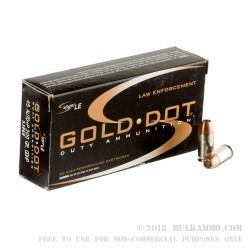 Speer's Gold Dot projectile design utilizes strong copper plating that has been applied via a patented Uni-Cor process in order to form an unbreakable bond. 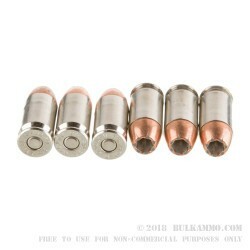 As a result, the 200 grain bullet can withstand the pressure of its +P charge without splintering or shedding. Upon impact with a threat, the projectile's hollow cavity and precise skiving produce wide expansion in a dependable fashion in order to create larger wound cavities and transfer fight-ending energy to vital areas. 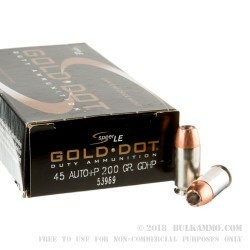 200 grains is a medium weight for the .45 ACP caliber and works well with the corresponding +P charge to lend great reliability to compact size handguns with no compromise in terminal ballistics. 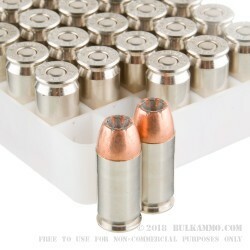 Each bullet is contained with a reloadable brass casing that is equipped with a clean-igniting Boxer primer and treated with a coat of nickel. Nickel coating resists corrosion caused by concealed carry sweat and reduces friction for smooth, seamless feeding and ejection. Speer is one the United States' premier ammunition companies and carries an excellent reputation for top-grade components which serve law enforcement officers at all levels. Q: What is the velocity and energy of this ammo ? A: Hello Dale! Speer lists the muzzle velocity of this round at 1080 fps with a muzzle energy of 518 ft. lbs.